Family calendars are the focus of week #52 of the Organized Home Challenge, and as usual I asked for those who completed the challenge to show how they use or organize their family's organizing system. Below I've got some examples from readers showing and explaining they use their calendars. I'm always looking for more examples too, so please show me how you've done it so we can all get inspired and motivated to create a system that works for our family. You can share your ideas and examples here, in the Home Organization Hall of Fame. Further, if you get inspired to create your own calendaring system, you can check out my step by step instructions for creating and maintaining a family calendar. Jennie has shared her family calendar with me, and I have to say it looks beautiful and functional (the best of both worlds). In our blended family we have 4 teenage girls from 13 to 17 and in any given week they are either home with me and my partner or at their other parents home. It is a challenge to know what everyone has planned. The 2 eldest have work commitments too so a family diary helps keep everyone informed of who is where and when. 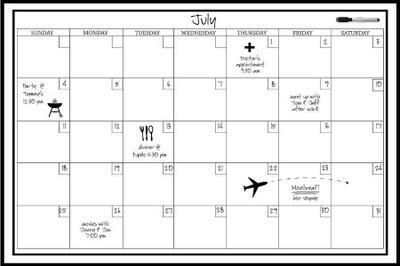 Thanks so much for sharing this calendar idea with us Jennie. I like the idea of color coordinating like I can see from the picture you do with your kids and partner. If you've got lots of kids in your family, or other family members you're trying to coordinate then letting each family member have an assigned color can keep your system organized even at a glance. I'd love to hear from even more readers who have family calendars, sharing how they maintain them and what works for them. You too could get featured in the Creative Storage Solutions and Home Organization Hall of Fame! 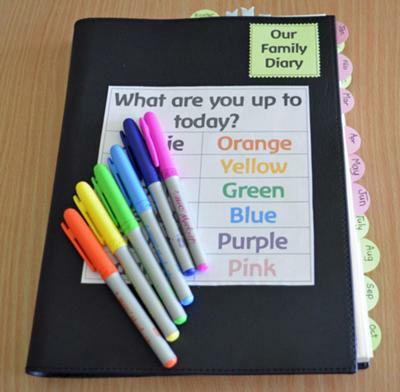 In response to Jennie's color coordinated family diary system, Suzette shared how she does something similar, but with a twist. We have coloured highlighters, including "kids with me" (yellow) and "kids without me" (orange), so that I can see where everybody is. They are still young. I am now teaching my dd age 12 how to use cozi.com, so that she can enter her assignments into the calendar while still at school. Cozi works, in that everybody can pick up the info, but I am still emotionally connected to my daytimer and highlighters. Everybody, including friends, know that if it isn't put into my book, it isn't guaranteed. The advantage of the Cozi version is that it can show me who is blocked out for what hours. Thanks for sharing your system for family calendars too Suzette. I have heard lots about Cozi, but had not tried it. It looks like it has some great characteristics and stuff for families though, and there is a mobile app for the iPhone and Android. Plus, the major thing I like about it is it is FREE! Has anyone else used Cozi or other online family calendars, and want to share how they've like them, good or bad? You can share your ideas and experiences here. 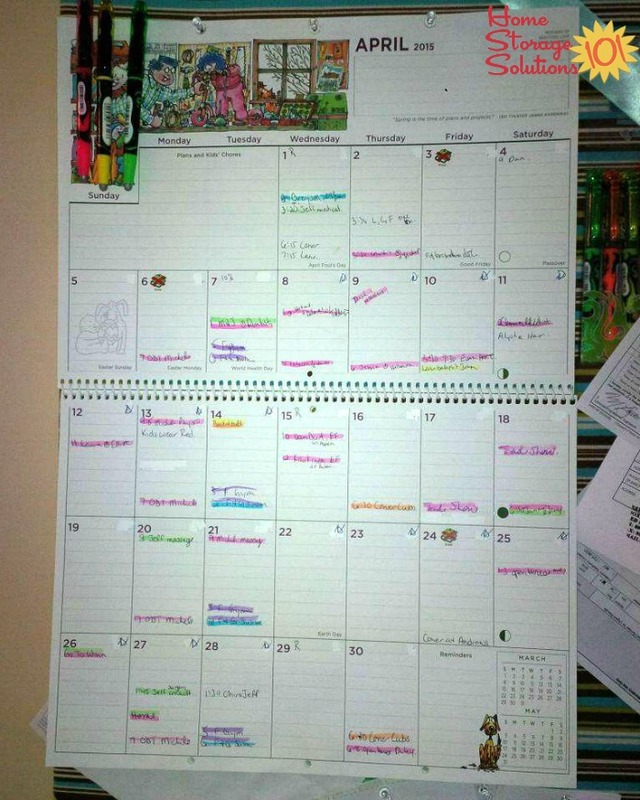 In addition, here's a photo from a reader, Michelle, who uses highlighters for her family to color code her calendar as well. I have a wall stick on marker calendar I bought at Amazon.com. It is 24"x 36." I put it in a frame I had and use that as my family calendar. It is the "center" of my command center." It is the smartest organizational thing I ever did. It is in my kitchen hallway leading to my garage entrance where everyone sees it and can update it. Thanks for sharing. Sounds like a great set up, and I think I found the calendar you were referring to on Amazon. Looks pretty sweet! I have two dry erase calendars hanging up. One for the current month one for the following month. Every family member has their own color and if it's a family function it is written in black. It took a little while but everyone goes to the board first before making plans. Several readers have shared with me that they use Google calendars to keep their whole family organized. We've tried lots of methods over the years but have found the best for us at the moment is Google calendars. We have one for hubby's work (he's on rotating shifts which gets confusing), one for meal plan, one for everything else (meetings, my work shifts, parties, appointments etc). You can share the calendars with others, sync them to your phones and the ipad and show more than one calendar at a time. Very useful and both hubby and I can see wherever we are whether we are free for an invitation, what needs to be cooked for dinner, etc. I love using Google calendar as our family calendar. As both my husband and I are on computers most of the time, it is easy to check in. I did like your comments of the advantage of a paper calendar, so I print one week at a time from the Google calendar to post on the fridge so we can all check in easily. It gives me the best of both without maintaining two calendars. Google Calendars For The Win! Another HSS101 reader stated: "We use google calendars too- couldn't live without it. I have 3 kids (19,17 & 13). I actually have about 20 google calendars (really categories) set up- one for each child, one for kids as a whole, family, school, my husband and I joint activities, meals, pets, etc. I give access to everyone for the calendars they need. With my older children it has been a good way to train them to start to use a calendar because they have to put their sporting events, activities etc. on there....or they can't go. As a mom, and the "logistics manager" of this household, it is vital! 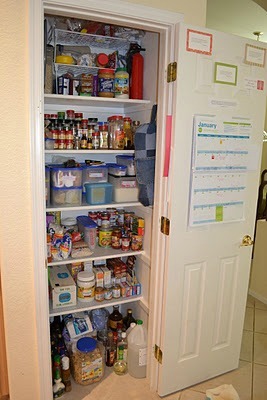 :)"
Jessica from A Homemaker In Training shared where she keeps her calendar, in her pantry. It makes sense. It is a central location in the house, but still inside a door so guests and visitors don't necessarily see it while family can. Thanks for the photo Jessica! I asked for people to share how they used Cozi for their online family calendars, and several of you have shared your information. I use Outlook which allows me to color code everything. It's especially nice because it allows me to cut and paste all the pesky little details that tend to come in through emails without much effort. At that point it syncs with Cozi which syncs with my husband's Outlook. No need to double enter anything, which is awesome! He always knows where we are or will be and so does his secretary if needed. You can also print out a weekly schedule from Outlook which fits nicely on one sheet of paper, also color coded so that little kids or anyone not computer connected has access too. Thanks so much for sharing your system for keeping everyone in the loop about the family calendars Distracted Mamma. Those are some great ideas! I am a HUGE fan of the Cozi.com site. I started out doing the FLYlady stuff so I have what we call our family "Brain". I combined it with the Cozi. I am able to keep track of my DH work schedule as well as my household schedule. My hubby and I are foster parents (waiting for a placement) so the Cozi and "Brain" will be SO helpful. I also have a dry erase calendar board that has everything on it too. I know this sounds like over kill but my hubby has had 6 brain injuries (due to a trucking accident in '02) that has messed up his short term memory. Thanks Becky for sharing your system. It does sound elaborate, but you know what, you've got to do what works. I'm not a fan of doing organizing tasks just to do them, but when they are actually necessary it is good to come up with a system that gets the job done, and with your husband's memory it sounds like this works really well for you guys. Meg says: I, too, use both Cozi and a wall calendar. I need a space to write things down at home, and to check quickly, like if someone calls to make plans. But, I also use Cozi so that when I'm out and about, I have that available on my phone. And my husband can make any changes. Sometimes, his work schedule will change, or maybe his work will give us baseball tickets. He can just check our calendar, then put it in! Also works for the grocery list, too. He will add stuff while at work, and I can see it. Love Cozi! Jennifer also shared how she uses Cozi for at least part of her family's calendar. Sadly, here we are a full week into February 2012 and I still haven't picked up a calendar. And even sadder...my husband hasn't missed the calendar. I have not done a good job of getting him on board. We do have a Cozi account and he gets updates whether he likes them or not :) So hopefully he will start being on the same page with me soon. Jennifer, I know it can be hard to use a calendaring system for your family when not everyone sees its necessity. However, don't get down on yourself. There are many advantages to having an online calendar, such as what you've mentioned about getting email updates regularly. Perhaps you can just build on the system you've got, and go from there! Remember, it doesn't have to be perfect - just do what it is supposed to do, keep you and your family on track with work, school and family activities. As you can see there are lots of reviews of the Cozi app for organizing and using your family calendars on the go. You can check out the great organizing apps recommended in the HSS101 App Store for more ideas of things you can use today on your smart phone, whether you've got an Apple or Android model. Have You Been Inspired To Start Your Family Calendar? 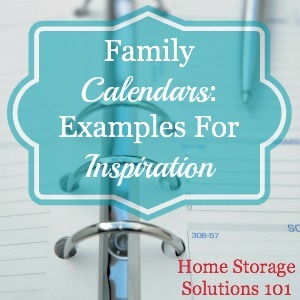 I hope these ideas have gotten you inspired to begin a family calendaring system of your own. As you can see, there is no one right way to do it. Instead, use what works for your whole family, and just get started. You can learn more in the Create A Family Calendar Challenge, which is part of the 52 Week to an Organized Home Challenge. That article shares all the steps to take to set up your own system. Once you've taken this challenge make sure to take pictures of your new calendar system, and share them with me here for the Home Organization Hall of Fame! I actually have been using colors for the different family members. It works great for all. I have an adult daughter & her 2 kids with us & 1 of them has ADHA so our white board hanging in the dining room is great for him. He examines it everyday & not only does it help him to know what is ahead but it helps to focus him. I use a large desk pad calendar with colors for each family member posted on the fridge. It's the only way for us with 5 kids. We've used this system since my kids were small (the youngest is 22 now). Even though they are all grown we still use it. I just use my Outlook calendar, it comes up daily on my email and I can set the alerts for the day before. I try so hard hard to keep one. Buy the prettiest ones, nice pens. But happens for a day or so, then back to notes on bits of scrap paper. We have a shared online calendar (iCal)- that is accessible on my husband's and my devices. I can change and update things on the run or at work as well as being able to easily add details from emails to automatically set up events. Regular activities are set up as repeating events so require minimal changes. Everything is colour-coded and they are automatically updated as one of us changes something. I also include details on who is picking up from school, if school slips / fees have been returned or paid so I can check the whole week at a glance. For the kids we keep a monthly version of their activities on the fridge. As they get older and have their own devices we will add them into our online version. I created a big wall calendar and had it laminated with dry-erase laminate. It is color coded so at a glance we can see the entire month. Each person has their own color. I have tried digital calendars and find them to be hard to maintain. I have a paper planner that travels with me and it too is color coded. 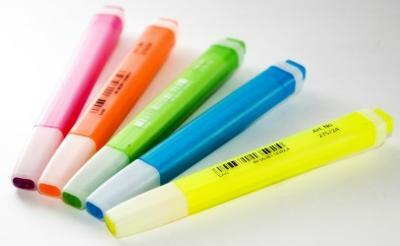 I use the Frixion ball clickers that are colored ink but are erasable. I have been using Google Calendar. My family is very "electronically oriented." I have color-coded each person, and given each of them the ability to modify the calendar. If they don't put in their weekly schedule I hound them until either they do it, or they give it to me to add. I don't mind adding it myself, since the calendar is mainly for my benefit so I can keep track of everyone. Besides, it IS all about me! Right?! I use Cozi for myself, but haven't been successful at training my husband & kids (3 teens) to use it. If there's an event that requires my husband to be there, I just put it on his Google calendar. For our home, I made a huge wall calendar out of our annual Chickfila calendar and framed it with trim from Home Depot. Whenever I make an appointment for someone in our family I text them the date and time and then write it on the wall calendar. I use a bought calendar which has multiple columns for each member of the family, it also has a spare column which I use for birthdays etc. I have a terrible memory and tend to forget to update the calendar so I use my iPhone to remind me of appointments this is linked to my iPad and outlook on the computer, that way it don't matter which 1 I update the others automatically update. This is also linked to my husband's iPhone so if I forget to tell him he still knows. I do try to make it a habit of updating the bought 1 on the kitchen door as it's easier for everyone to see when and where we are. I have been hanging a simple monthly paper calendar on the refrigerator for years where we record our daily happenings. I save the pages, gather them at the end of the year with any special papers (deaths notices, births, etc. ), staple them together and store them in a closet. Any time we need information - like when was my last jury duty, it's right at our fingertips. We have a record of our son's first step to his college graduation and everything in between. It's fun to look back through the years and reminisce. I use a desk blotter style calendar to keep track of my family's activities. 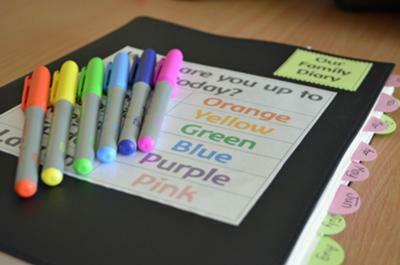 Color coding allows us to quickly identify milestones such as birthdays and anniversaries. I also use a different color for each family member. At the beginning of the year I start by adding the milestones throughout the entire calendar. This includes any doctor appointments that are already scheduled. The calendar is hung in our command center so everyone can see it. Keeping my four active kids going while I work out of town is a challenge, but COZI is the best way for all of us to communicate. Any of us can view the online app and see where Mom is, or where they are supposed to be at any given time. My teens have learned to check Cozi BEFORE asking about plans! We have reduced to a family of three now, but still all go different directions all week. The best thing I ever did was purchase two wooden framed Board Dudes plexi-calendars. One for the current month and the other the upcoming month. I decorate the headers according to each month. Sometimes I just write the name of the month. They hang in our kitchen/back hallway where everyone passes several times a day headed to their car in the garage. A quick check to update on the way out the door to keep us on track. Each of us has a personal color. And RED has been designated for important info not to be missed! We use vis-a-vis markers only. At the end of the month I take down & clean the top board, move the new month up to the current spot, hang the clean one and begin adding info. With a blended family of 5 teenagers, Cozi has been our lifesaver! Each of our kids plays on at least 2 baseballs teams year round - so this is where Cozi stands out from the rest. I assigned each of us a color and added all games, practices, teams, and locations. Everyone in our family has downloaded the app and can see who will be where at what time. From carpooling to school activities, with Cozi we all know who is where and where we're supposed to be! This even helps us plan "date night"
Cozi Gold has been worth the extra money to get additional reminders (up to 3 per activity) AND it allows me to assign team calendars to share with family members. I LOVE COZI!! Our family couldn't function without it! We use google calendars - each family member has their own that is shared (Mom, Dad, Son - 8 yrs old, Son - 3 yrs. old). My sons are too young to update theirs but now they are old enough to be at activities by themselves (when I was always with them it was on my calendar). Since it could be my husband or me that takes them to the event we put the kids stuff on their own calendar and decide which parent handles it. We also have one called "family calendar". That is one that requires ALL of us to be at (holiday meal, special concert or game, graduations, etc). This also helps when my hubby and I are booking something for each other (car repairs or house service people) - that way we don't double book!). My husband travels often and my 2 kids (14 and 9) are very active. All 4 of us have access to this one account and write in it as needed. We do not need to be home to check who is doing what. We each have a "calendar" which should be called a tab or category. I also have birthday/anniversary/holidays tab. When there is a particularly crazy month, I do print it out. I find Google Calendar efficient, effective and simple. I love Google Calendar, it took me a while to get the wife on board, but she loves it now. I work a lot of athletic events, so the schedule varies. 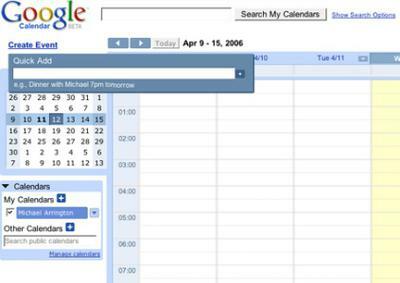 I used Google calendar because it would sync with my phone, so I always had it. She wanted a calendar on the fridge, but when I took a time management course, the first thing they said was to use one calendar, not 3 or 4. Something will get missed. Google Calendar allows us to do one calendar, I can see her events, she can mine, on the desktop, the tablet or the phone. Works like a charm. And, it's free. I put my calendar on the inside of my linen closet. It's written in black and my outside appts are underlined in red. The whole month is written out, plus my daily list on the side. Keep up the good work and thank you for your help. This article couldn't have come at a better time! My mother (80) is in early stages of dementia, so I've moved my job closer to her in preparations to move in with her. I stop by every day after work and go through her mail. She was scammed last year. Someone stole her checkbook and she was getting late night calls and sending money to Jamaica to win her millions. Everyday I toss sweepstakes and "donations", she'll find and pay old bills, and never knows what day of the week it is. Having all her actual bills in one place (thank you auto-draft), Dr appointments, and marking off the days of the week will help us both. I can also add family news and pictures to keep her mind active and remember the great-grandkids! I also have a dry marker calendar in the hallway from the kitchen to the garage. It has been in use for 20 years. I hung it right after we moved into our house. My daughter played softball and my son played baseball. To keep me sane, I instituted the use of the calendar. My husband could see where we were when he got home from work. Now we write doctor appointments and my son's work schedule on it. Google calendar AND wall for us! We have tried a lot of different methods. Since half of our family had cell phones, and always have them with us, online made sense. But Cozi was confusing to a couple of my kids, and trying to sync each individual Google calendar started to clutter since each one had national holidays and family birthdays (resulting in 4 copies of some events in my calendar). So, we set up a separate email for the family. Each person had access to that email, and that calendar is all that we sync. Each family member is color coded so we can see at a glance where each person is. While that works great for us, it didn't help our younger kids. So, I designed a family calendar on my computer (basically the day view on Google) and print it off. Each week I transfer the Google calendar over into the wall. I use highlighter colors that match the ones online. Sounds a bit confusing, but works for us. My husband and I switched to using Google calendar for showing all appointments and events. It has proved helpful so many times when we weren't able to see the paper kitchen calendar but needed to schedule or check on something. I love the way one of us can add or edit an event, and the other of us receives instant notification. With 4 kids in the house, three in school, keeping track of them without their assistance is impossible. All calendars are shared with my husband and myself, so we know what is going on. Add two Guiding organisations (Local and Regional) that I'm involved with and life can be really busy and interesting. We have tried another calendar program and this works so much better. We also love the Keep function which is an additional feature from Google, we can keep track of any items that the children need for their various activities. We love Google and won't be changing anytime soon. Thanks Google for a fantastic program. A Color for Each Child!! My husband and I also had a blended family of six children. When they were young I had a giant calendar that hung on the wall in my kitchen; each family member had their own color. It is a system that works wonders when you have multiple children. I now do the same thing with my grandchildren. Each one has their own color so Grandma can keep up with them.... lol!